Bomet Governor Isaac Ruto hosts a mock rally in Bomet to welcome Jubilee traitors. - Bana Kenya News, Real African Network Tubanane. 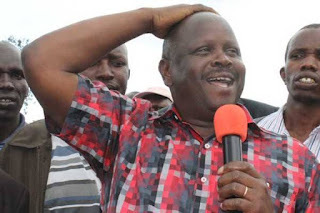 Home Gossip News Bomet Governor Isaac Ruto hosts a mock rally in Bomet to welcome Jubilee traitors. Bomet Governor Isaac Ruto hosts a mock rally in Bomet to welcome Jubilee traitors. Bomet Governor Isaac Ruto who is among the NASA principles welcomed all the people in the Jubilee who are frustrated with the nominations. Talking at Bomet, the Governor said that anyone who will wish to defect from jubilee to the CCM to come and register. "There are enough papers for you to register, I told you that that party will make you cry from the nominations to the end. People already have a list of leaders who are yet to be made public, so the people do not have business with the nominations.The jubilee Party is a total disgrace to the people of Kenya." Said Ruto. The Governor claimed that people should wake up and vote that Jubilee government out. The governor claimed that getting back jubilee to the state will bring this country back to economy crisis. The governor who was crowned as the political KingPin of the Kipsigis community urged people to keep calm and vote for the greater government which will make things cheaper and affordable life.